We're having a party and you're invited. Watch this VIDEO from our launch party! It’s an impossible thing to carry two thousand copies of Quotidian. I know only because I tried. The weight of four hundred was enough to almost throw out my back, and in the end I had to take five loads of just that. Five loads of four hundred copies, bundled and packed into the improbable space of two cardboard boxes. It’s only a few blocks from my flat to the printers, but after the first I was gasping for breath, arms locked up and sweat dripping into a sticky pool on my back. I spread the labour across several days (almost two weeks) and when I came for the third trip, Tommy, the owner of Glasgow Cross Press, asked if I wanted him to deliver the rest. It seemed excessive to go through the process of loading up a van just to drive three blocks. But at the same time there was something about the act of it, something about feeling the weight of all those words in my arms. I’d been carrying them home with me for six months now, ever since the first submission dinged our inbox to life, but now we had something to show for it: something material. I was proud of that weight. And the act of lugging it—the labour and sweat and panting—was a commemoration. Those two thousand copies have since been distributed across Scotland, bundled and wrapped for postage. Quotidian has found a home in universities and colleges, libraries, cafes and bookstores, from mainland Europe to Iceland and all of the way to the United States. Our stories are being taught in college courses, our authors have gone on to publish collections of poems and short stories—novels, even—and our readers are sharing at a volume we’ve never seen before. Three years ago, Melissa and I set out to create an aesthetic and engaging publication that simultaneously connected emerging, undiscovered authors with a widespread audience. Now, with our PhDs coming to a close and the future of Quotidian undefined, I’m proud to say that we have not only accomplished what we set out to, but that our mission has expanded beyond what we ever thought possible. Issue Three carries that mantle into perhaps our best issue yet. After receiving more submissions than ever before—and struggling desperately to settle on twenty-four—we as a team are proud to project the diverse and fascinating voices of our newest authors. Their stories cover everything from the tragi-comedic stranding of a hearse to how, picking blackberries in an open field, we can briefly remember what it means ‘to just be.’ They spiral us into our youth and hurtle us across generations, covering a range of dialects from Shetland to expatriate blend and leading us, in the end, back to our beds at home—to our seats on the train or in the office—through a living medium that grounds and connects us all. So Issue # 2: the Print Edition is now here! And it's pretty beautiful (in our humble opinion). We are especially excited to feature some wonderful illustrations from emerging artists: Phoebe Roze (who created the cover), Kirsti Beautyman, Vivian Uhlir, and M-C Redman. We had a launch party to celebrate on Wendesday 11th May, and were delighted to have Perry Jonsson come and film the event (see the lovely video above). Calling all artists studying in Scotland! Quotidian Literary Magazine is seeking artwork from talented and emerging illustrators to feature in the print edition of our second issue. For our first issue, we had some fantastic illustrations from Jade Hall and Federica Giardino (see below) and this year we’re looking to maintain that same level of quality by forwarding this opportunity to students across Scotland. The theme of our magazine is ‘the everyday’ and we’re looking for sketches and/or paintings to go alongside specific poems and stories in the print magazine, ideally work that bleeds well into a white/off-white background. If you’re an illustrator and think your style of work would fit well with our magazine, contact us at editors.quotidian@gmail.com with a bit about yourself and a link to some of your work (e.g. your website, Facebook page or online portfolio) and we’ll can give you a fuller brief of what we're looking for. "How to read a poem"
The lovely Quotidian editors approached me recently asking if I might write a guide on how to read poetry for readers who maybe haven’t read much poetry, or read poetry in schools but weren’t big fans. I certainly get that feeling: so much education in poetry seems to have the aim of “beating it with a hose / to find out what it really means” in Billy Collins’ words. I think many of us approach poems warily, already sure that they’ll go over our heads: that they will be complicated, needing breaking down and analysing, or that they’re simply not meant for us. And that’s so unfortunate, because there’s an incredible world of work out there to explore, some of it challenging but much of it simple and brilliant. The pieces we selected for this issue of Quotidian certainly fall into the latter category: they’re beautifully written meditations on the everyday that you certainly don’t need an Oxbridge degree to enjoy. it was never meant for stillness. You will learn not to be careful with it. is how a poem changes the world. Issue #2 is launched - and we’re incredibly excited about everything it is, and all it’s going to be. With the start of the New Year, though - and the anniversary of our first issue - we thought it would be fun to give a little recap of everything that’s happened since the début of our print. So, there was that - our overwhelmingly successful launch party for the print edition - at which we distributed two­-hundred copies of the magazine. And over the next two months, we distributed hundreds more! Copies of Quotidian drained from our hands faster than we could replace them. Bookstores were featuring us at the front of their tills; Glasgow Libraries wanted our ISBN so they could feature us in all of their branches; we even had readers in Sweden, Switzerland and Nova Scotia emailing to request copies of the print! And we sent them. Because when we said that Quotidian was going to be a free literary magazine, we meant it. However, free distribution inevitably leads to a question of funding. We needed money to keep the website running through Issue #2, to print future issues, to put on events, to buy merchandise and to keep the magazine free for our readers. So we applied to the University of Strathclyde Alumni Fund and, after an intense application process, we got it! Since this monumental milestone, we’ve been able to represent ourselves at student fairs, design monogramed pens, renew our website, and push Quotidian even closer to our vision’s potential. One aspect of that vision is to maintain Quotidian as a leading platform for beautiful and literary writing. And, because Issue #1 set the standard for quality rather high, our staff dedicated the entire autumn term to sharing and promoting Quotidian’s submission deadline. The result was startling. We received twice as many submissions as we did the year before, and all of a quality that made selecting the final 24 as difficult as ever. The pieces in Issue #2 are different from last year. They’re diverse in tone and medium. They cover topics from identity and loss to the simple notion of what it means to listen. They’re isolating at times; they’re descriptive and lonely, and some of them carry enough weight in a single word to crush the pocket of air between your heart and your chest. But you will also laugh. You’ll smile and sigh and feel the titillating creep that comes with the magnetic pull of the perfect moment. So allow yourself to amuse passersby. Let yourself flinch and smile and gasp in the presence of coffee shop patrons, other passengers on your train, because that’s exactly what this issue has to offer - an experience of the quotidian, the everyday, that is anything but ordinary. seeking submissions for Issue 2! Submissions are open to all students studying in Scotland - full guidelines can be found by clicking the submissions link (up there). Feel free to get in touch if you have any questions. And have a read through Issue One if you haven't had a chance to yet. It's going to be hard to beat such a great debut issue! We are delighted to announce that we have been awarded a bursary from the Strathclyde Alumni Fund to finance the next few issues of Quotidian! Every year, Strathclyde’s alumni community makes direct contributions to support student projects and publications. We are grateful and excited to be receiving their support. 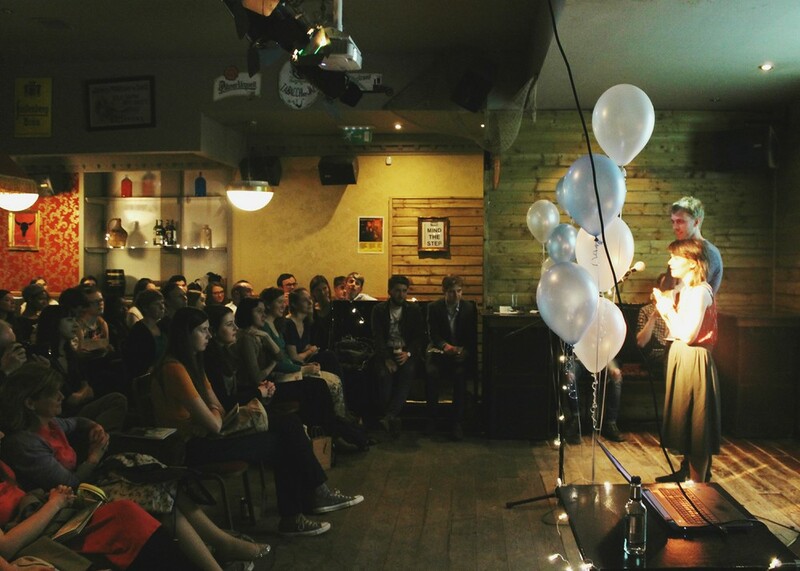 Here are some (slightly belated) pictures from our Issue One Print Launch Party back in May. As far as parties go, it was a pretty good one (if we do say so ourselves). We had balloons, and live music, and cake, and strawberries, and readings, and slam poetry, and candles, and wine, and so many people came along we actually ran out of chairs. We had no awkward dancing. No flashing lights. No this-song-is-too-loud-so-I-need-to-shout-to-make-myself-heard-and-now-I’ve-lost-my-voice-and-have-gone-deaf issues. (General party-related complaints). Not bad. Thanks to everyone who came along, and to the Project Café for hosting us. We're now making preparations for Issue 2 (deadline for submissions December 1st 2015) and will keep you posted on that! Exciting news! We're publishing a little print version of Quotidian, Issue One, featuring select pieces from the website alongside new artwork from Scottish artists. We'll be sending it around Scotland, and can't wait for you to see it! On that note... we're having a launch party (and all-round general celebration of Issue One) on the 7th of May at 7.30 in the Project Cafe, Glasgow (134 Renfrew Street) where you can get a copy of the print. There'll be cake, poetry, fiction, music, pictures, candles... and a chance to meet the writers and editors behind the magazine. The event is open to everyone and anyone who likes the magazine. Bring your friends! Bring your Gran! We'd love you to join us. Full details can be found on our Facebook event page which you can find by clicking: here. You might have noticed that, since the last post of Issue One, we've been a little bit quiet on here. That's because we're busy working on something pretty exciting! Stay tuned for more news soon (and happy Spring to you). A note from our co-editor, Stephen O'Shea. After crossing from San Antonio to Scotland in the reverse migration of those Scots made martyrs at the Texas Alamo, I immediately contacted Melissa Reid. 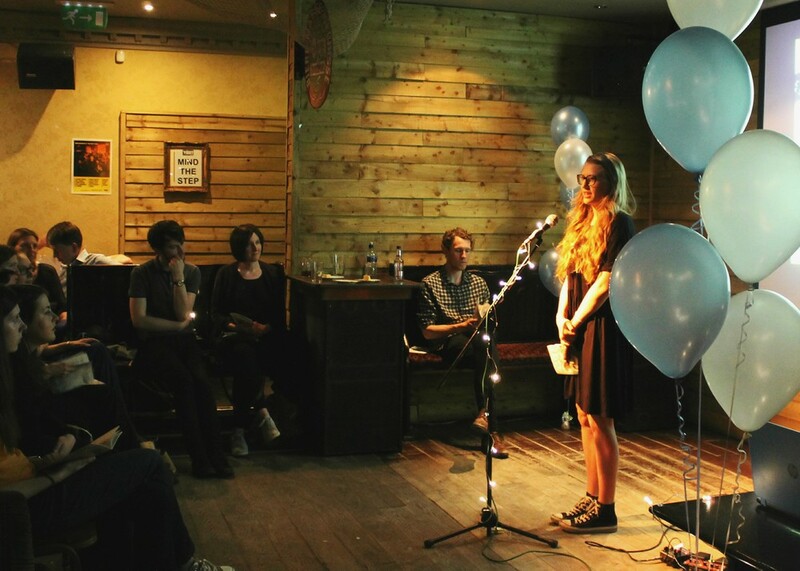 This second-year, postgraduate author wanted to launch a Strathclyde literary magazine, and I wanted in on the ground floor. I’d no knowledge of the project’s development or what my role in the magazine would be, but my supervisor, Dr. Colin, spoke highly of Melissa. And Melissa delivered. Her idea for Quotidian, a magazine featuring literature on the “everyday” via brisk online publications, grabbed my attention and held it. Melissa scribbled life into the idea of a multi-media magazine, and by the end of our first encounter she had made her vision my own. There was the practicality of targeting a modern audience with literature of a consumable length alongside the simplicity of the magazine’s style and format; and yet the whole thing unfolded beautifully, complex and multifaceted as literature itself. I bought in, and over the next several months—as I settled into my degree at Strathclyde, found work and involvement with university clubs and organizations—I continued meeting with Melissa to accomplish the hidden layers of labor that build a magazine from threads of ideas to the world-wide web. There were applications for funding, registration with the Student Union, spreading social media awareness and sprouting a grassroots initiative for submissions to our debut issue. There was an editorial team to build, an awareness IKEA fieldtrip to plan, and Scottish universities to be networked. There was a website to create—templates, formats fonts—there was a submissions system to devise and, finally, there was writing to be read. When Melissa and I first talked about launching Quotidian through the University of Strathclyde, my only skepticism was the quality of submissions we would receive. Melissa’s plan—highlighting the subtleties of realist fiction with the vision of a manifold online presence—promised the framework for a brilliant medium. However, there was one requirement for the development of a great literary magazine that was beyond our control: and that was great literature. My skepticism spawned not from an ignorance of Scotland’s literary reputation—this was a primary factor in my crossing the pond—but from a fear that Scotland’s writing community would not take our magazine seriously. The night of our submissions deadline, this trepidation was mollified. With a hundred submissions from over half a dozen premier universities across Scotland, the quality of submissions to Quotidian surpassed all expectations. Melissa and I read every single story and poem over the winter holidays, and after consulting our assistant editors for a tentative shortlist, the entire team came together to discuss which pieces would be featured in our debut magazine. 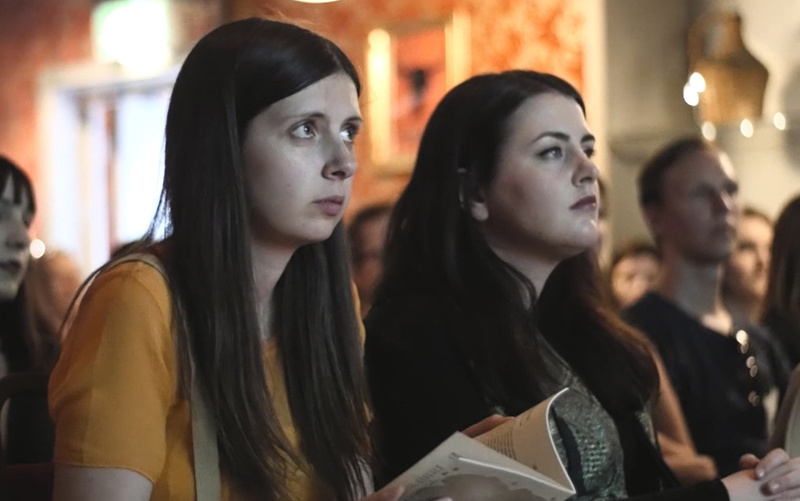 What I can promise you, our reader, is that these stories will stick; the poems will whisper in your mind long after you’ve closed our tab; and the literature you read will be from the best new writers across the whole of Scotland.